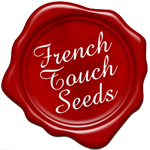 French Touch Seeds have a culture of healthy and easy to grow seeds. Less distractions mean focusing on the demanding job of breeding that requires your passion and focus. French Touch Seeds primarily sell feminised seeds and they had to answer to that growing demand, but they are guiding expert growers on regular seeds and conservation of their favorites strains. These are passions and practices that are now widespread among our compatriots. FTS strives to preserve old varieties and they\'re adding landraces from different corners of the globe. Starting with two strains from the Réunion Island that are currently available - The K1 and the Mangu Carot.